Welcome PAC'11 Attendees - Meyer Tool & Mfg. In honor of the 2011 Particle Accelerator Conference (PAC ’11), Meyer Tool & Mfg., Inc. would like to invite attendees to catch up with the latest happenings at Meyer Tool. If you are not already familiar with us, please take the time to get acquainted. We look forward to doing the same. For those who are not aware, Meyer Tool publishes a monthly e-newsletter normally received by over 2,000 people interested in cryogenics, vacuum or pressure related topics. 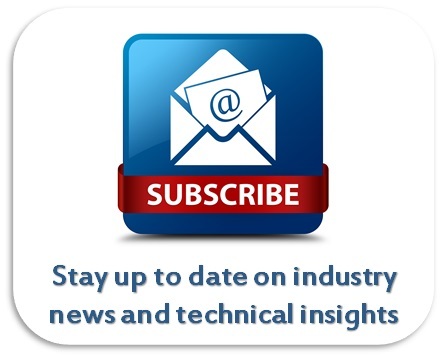 Our newsletter presents general and technical articles of interest to engineers and scientists working with these technologies. We hope new readers will find this issue informative and useful and choose to stay on our mailing list. 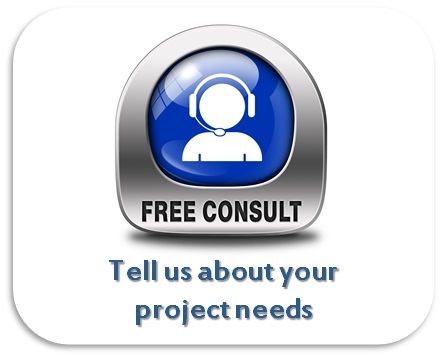 Feel free to browse our archive of technical articles located on the Reduce Project Risk page of our website. We also have a complete archive of our newsletters available. While at the PAC’11 please visit us at Booth #403 in the main exhibit hall. The Industrial Exhibition runs from Monday, March 28th through Wednesday, March 30th from 10AM to 6PM on Monday and 9AM to 6PM on Tuesday and Wednesday. Ed Bonnema, VP of Engineering and Operations, and Eileen Cunningham, President, will be available to discuss how Meyer Tool can assist in Reducing Project Risk to achieve the lowest total cost of ownership on your project. After all, Meyer Tool has been building components for accelerators since its inception in 1969. Components have ranged from cryomodule assemblies to ASME Code stamped helium vessels surrounding Niobium SC RF Cavities and other unique, one-of-a-kind or short run projects. Not only will we be there, but we are excited to unveil our recently upgraded booth and video presentations. ​We also will be presenting a poster on “Fabrication of the Jefferson Laboratory Cryogenic Control Reservoirs” on Tuesday, 3:30PM-5:30PM Poster No. 175. Don’t miss this informative poster session. Meyer Tool is a supporting member of the Superconducting Particle Accelerator Forum of the Americas (SPAFOA). Please drop by if you have questions about how the organization works to promote and support Particle Accelerator Science. The PAC is always a great opportunity to catch up with industry happenings while being exposed to the latest advancements in accelerator technology. PAC’11 promises to be no different. We look forward to seeing everyone the last week of March! 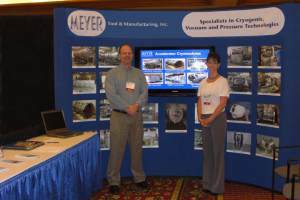 Ed Bonnema and Eileen Cunningham of Meyer Tool in front of old conference booth.